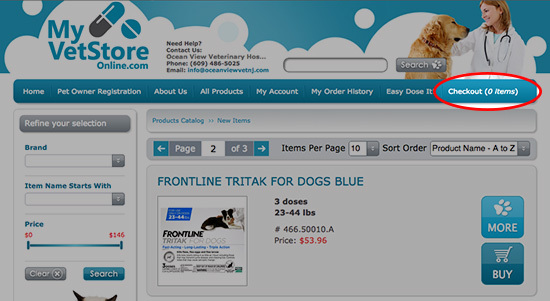 Click on the My Vet Store Online logo or this link to go to the website. REGSITER OR LOGIN to purchase prescription items, schedule future orders, or use a promotion code. You may not need to login to purchase non-prescription items. • Enter your contact and pet information. Click REGISTER. • You will be automatically logged in and ready to shop. • Type the item name into the search field at the top of the page. Found what you’re looking for? Click the BUY button to add to your cart. • Choose your pet in the patient’s name drop-down menu or enter your pet by clicking ADD NEW PET. Then, click SUBMIT. • If you would like to schedule monthly deliveries of the item or receive the item at a later date, check the YES box and choose the dates you would like to receive the item. • Click CHECKOUT near the top right of the page to review your cart. • Enter your name and shipping information; if you are logged in, your information will automatically appear. Click CONTINUE. • Select a payment method & enter your payment information. • Click CONTINUE, and finally click CHECKOUT at the bottom right. You’ll receive an email confirming your order shortly. Once we’ve reviewed any items requiring approval*, your order will ship, and you’ll receive a second email with tracking information for your purchase. If you have any questions, please give us a call. *Please allow up to 48 hours (2 business days) for approval of your order. Call 609-486-5025 for immediate assistance.